This is the part I've been dreading. Selling my story (Selling myself). It seems boastful and showy to "talk up" my story. How does one remain humble and sell their story? One of the synonyms for humble is unambitious. So I must learn to put myself and my story out there. I will start by thanking the writers who paved the way for me. Who have shared what they've learned about the writing process with other writers via their blog, an interview and in books filled with gems of wisdom. Who have shared how to to write fearlessly, with color and texture and brevity. Your generosity has helped me immensely. Who griped and moaned and complained about writing a synopsis. Their words of angst, anger and utter aggravation have helped me feel normal and validated as I delete lines of writing. Why is this so hard? I wrote the novel, surely I re-tell the story in a nutshell...or within a couple of pages...ugh. I'd like to thank the writers who've gone before and have generously shared the process of querying agents. Who have waited and suffered rejection. Who wrote about the upset and their endurance and perseverance. Who have shared that sometimes it takes a long time to find that perfect combination of story, timing, agent, publisher and audience. I'm prepared to be patient. 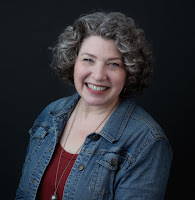 Because of your willingness to share your experience, writers like me feel better prepared for the process and possibilities of publishing our work. Thank you. Last week I went to Macy's and made a purchase. The saleswoman said, "I love your hair!" The compliment was especially meaningful to me because I recently cut the last strands of color from my hair...it's all natural. My hair is also naturally curly which does inspire a compliment or two on occasion but since the gray transition was recently completed, deep down I hoped she meant the color. "Is that natural curl?" she asked. "Yes. The curl and the color is natural," I said. "Well, I figured the color was natural but your face is so young, the gray looks great!" She is by far the best saleswoman EVER. I thanked her and went on my way with a smile on my youthful face. I stopped at Goodwill on the way home and purchased a book. "Are you a senior?" The unsmiling checker looked at me, waiting for a reply. I was still soaring from the "young face" comment. I crashed to earth and said, (perhaps a bit too enthusiastically) "NO!" I cheerfully added, "But I'll take the discount anyway." He gave me the discount. I choose to believe he was being nice, not that he thought I was lying about being a senior. Because the truth is, I'm NOT a senior! 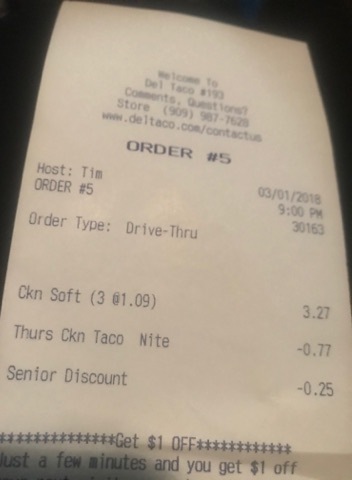 "I just received my very first, completely unsolicited SENIOR DISCOUNT. I don't know whether to be appreciative, or to cry!!" I laughed (a knowing laugh). She sent me a picture of her receipt. That hit to the ego saved her a measly quarter. We messaged back and forth about the irony of the senior discount. It's not fun being on the precipice of a new "identity". It's always a young kid offering the senior discount...a kid who has decades to go before he'll be accused of being a senior. How could he possibly have the skill set necessary to identify a senior citizen with a quick glance? My friend said, "Asking someone as young as we are if they're a senior is like asking a fat lady when her baby is due. It is only through age and experience that we learn not to assume anything...a rookie mistake made by young people and oblivious old men." She's always had a knack for comparisons. She added, "We should embrace aging gracefully and enjoy the perks along the way. I've always loved a discount! I stumbled upon this verse this morning. And by stumbled upon, I mean I was looking something up and mistook a two for a five and read John 21:25 instead of John 21:22. This was a blessing to my heart. I am nearing the end of writing and revising my novel. Why am I writing a novel titled: The Grace Writers? Because I am a recipient of lavish grace. Because I want others to know the grace that is available to them. Because I want to illustrate (with words) that nobody can out-sin grace. Because I love the Lord so much, I can't keep this knowledge to myself. Because I love people so much, I can't keep this knowledge to myself. THAT is why I'm writing a novel. And then this verse...read by mistake...but exactly what I needed to read. Because if they were all written down, the whole world would not have room for the books that would be written.